The University of Wisconsin-Oshkosh is a comprehensive university in Winnebago County, only a couple of miles from the shores of Lake Winnebago. Students here may choose a number of career paths, including popular majors in nursing, marketing, and elementary education. Describe the type of student who should not attend University of Wisconsin-Oshkosh and explain why. Someone who just wants to party all night and sleep all day. That is not what college is for and if you feel it is Oshkosh is not the place for you. Describe the type of student who should attend University of Wisconsin-Oshkosh. Why? I believe any type of student should attend UW-Oshkosh. It should not matter what kind of student you are as long as you come to learn and get a great education. What is a typical University of Wisconsin-Oshkosh student like? Describe the type of person that should attend University of Wisconsin-Oshkosh. What are the top 3 reasons someone should attend University of Wisconsin-Oshkosh? What was a typical University of Wisconsin-Oshkosh student like in high school? Describe the type of person that should attend University of Wisconsin-Oshkosh. The campus community promotes enrichment and active learning with opportunities for sports and recreation, arts and culture, service learning and career building. Approximately 13,500 students benefit from the nationally recognized expertise of our faculty, a wide variety of courses and degrees offered -- including 58 undergraduate majors,17 master's degree programs and one doctoral degree (Doctorate of Nursing Practice) -- and modest class sizes that foster one-on-one and collaborative learning with professors, rather than teaching assistants. What are the top 3 things that students do for fun at University of Wisconsin-Oshkosh? The average student pays $11,703 for tuition, fees, and other expenses, after grants and scholarships. Total stated tuition is $6,422, in-state and on-campus, before financial aid. Learn more about financial aid at http://www.uwosh.edu/fin_aids/. Estimate the net price for you at http://www.uwosh.edu/fin_aid/costs. The typical (median) early career salary of University of Wisconsin-Oshkosh graduates is $40,100, according to Payscale. University of Wisconsin-Oshkosh participates in the NCAA Division III for college athletics. 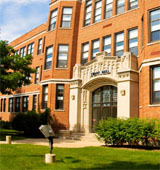 Want more info about University of Wisconsin-Oshkosh? Get free advice from education experts and Noodle community members.